The temperature in Rocky Mount was tipping 100 degrees and the hallway of Nash Community College was hot, as it held hundreds of people lined up to speak on the Atlantic Coast Pipeline. Nothing sounded better than a cold glass of water. But these days, with contaminants known and unknown flowing from their taps, North Carolinians can no longer take clean water for granted. 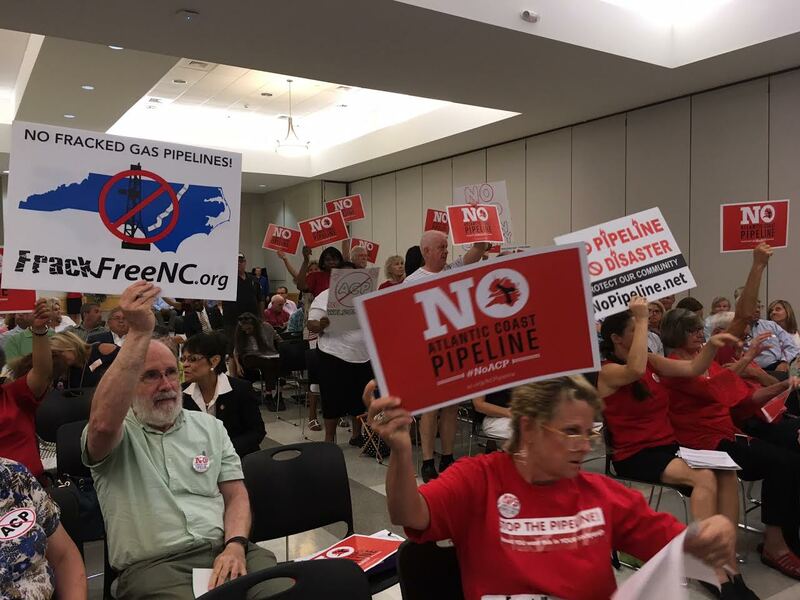 Worries about their drinking water, as well as property values and environmental damage, compelled hundreds of people to attend the NC Department of Environmental Quality’s two recent public hearings on water quality and buffer requirements for the Atlantic Coast Pipeline. Federal documents acknowledge the pipeline, could further harm North Carolina’s water quality — and quantity — as contractors drill below or trench riverbeds, flush the pipeline segments with municipal water, and potentially change the flow of groundwater to private drinking water wells, via blasting and digging. 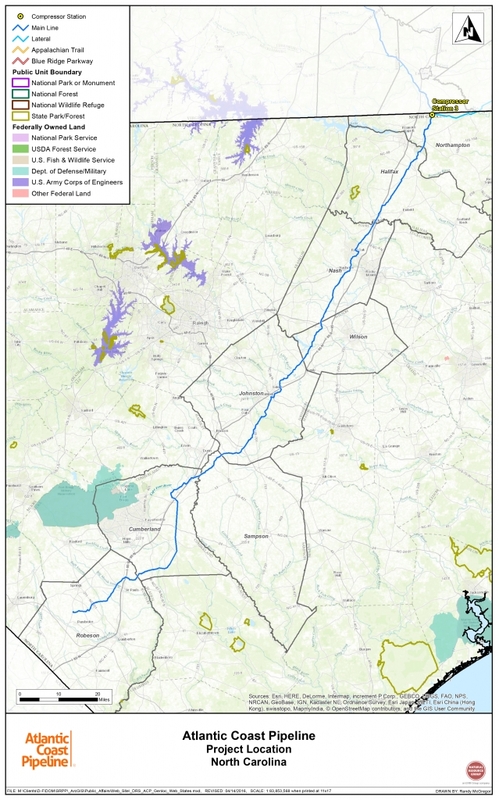 But the Federal Energy Regulatory Commission, in its Final Environmental Impact Statement released on July 21, concluded that as long as Duke and Dominion contractors followed the rules — apparently discounting the likelihood of human error and unanticipated problems — permanent impacts to water, wildlife and the welfare of the eastern North Carolina ecosystems could be mitigated. The 600-mile pipeline, of which 160 miles would traverse North Carolina, would be co-owned by Dominion Energy and Duke Energy. The purpose, the utilities say, would be to increase reliability for Virginia and North Carolina customers. However, this doesn’t mean that natural gas would be delivered directly to residents’ doorsteps. Once the natural gas leaves the fracking operations in West Virginia, the two utilities would use 79 percent of it to generate electricity at their own respective power plants. Just nine percent of the natural gas would directly serve residential customers. They could have to pay a connection fee of at least $1,000, a cost largely out of reach for low-income North Carolinians. Another nine percent would serve industrial customers, who would also have to pay a hefty connection fee. And some of the energy, according to the FEIS, would leave the region altogether and be traded on the commodities market. Regardless of where the natural gas ends up, customers would pay for the $5 billion pipeline through rate hikes on their utility bills. There could be future rate hikes related to the pipeline. If it’s built and finished — approximately in 2019 — Duke and Dominion could ask FERC for permission to expand it. As NCPW reported earlier this year, forests, wildlife habitats, wetlands and communities of color, including Native American tribes, along the route could be harmed by the pipeline, even if that damage is temporary or “mitigated,” as required. But the potential environmental injury to the waterways could ripple farther downstream to towns that depend on the Neuse, Cape Fear, Tar and Roanoke rivers, and several of tributaries, for their drinking water. More than two-dozen private drinking water wells in Northampton, Halifax and Nash counties alone also lie within 50 feet the pipeline’s right-of-way. Another 20 are within the “workspace” in Johnston, Sampson, Cumberland and Robeson counties. Taylor criticized the utilities’ water quality application to DEQ. 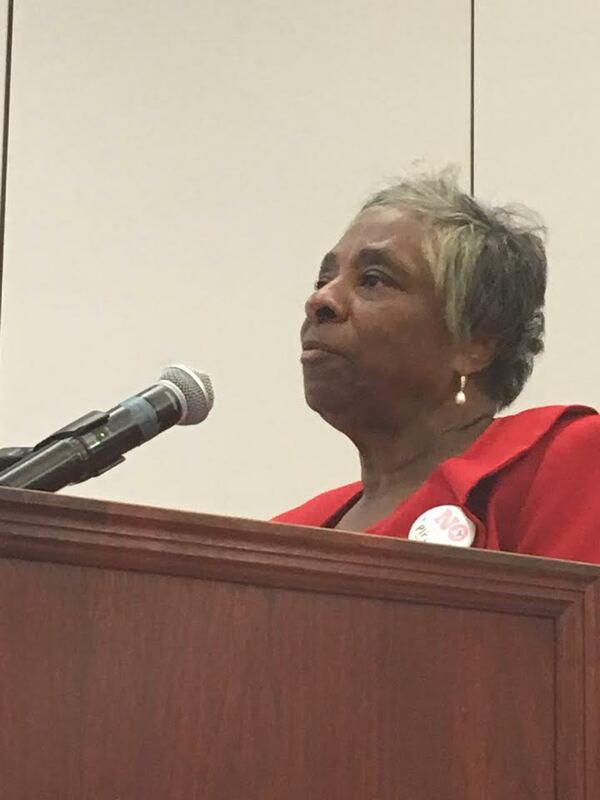 “It fails to consider impacts on groundwater,” she told the crowd in Rocky Mount. Construction, which would include blasting and enormous amounts of excavation, can change surface patterns and groundwater flow. The pipeline would hug much of eastern North Carolina’s fall line, a natural formation that separates the Piedmont from North Carolina’s coastal plain. Here, rock meets sand. The North Carolina Coastal Plain aquifer, underpinned by sand from ancient seas and shorelines, is permeable, the groundwater vulnerable to pollution. And in eastern North Carolina, where the population is largely rural, many people depend on groundwater for their private wells. A cofferdam would require contractors to remove aquatic life from the area to be pumped. Inevitably, some would die, including the Neuse River Waterdog, a rare salamander indigenous to the waterway. In the Final Environmental Impact Statement, the US Fish & Wildlife Service requested that contractors refrain from using the cofferdam method and instead, drill horizontally beneath the river. But this is only a recommendation; FERC would have to enforce it through its certification process. Not only are there water quality issues, but also those of water quantity. Contractors would have to withdraw millions of gallons of water to test the pipeline’s strength and to flush out drilling mud. Once removed, the sediment and mud, according to the FEIS, is prohibited from being put back into the river. Duke and Dominion did agree to not withdraw water from rivers where Atlantic sturgeon are known to live, as was the original plan. And it would limit its withdrawals from the Tar River and Contentnea Creek. Instead, contractors would tap into municipal water supplies, although no back up plans were listed in the FEIS for this water usage in case of drought. Those who supported the pipeline cited the economic potential it would bring and dismissed any environmental concerns. Stephen May spoke in favor of the pipeline on behalf of the Consumer Energy Alliance, a front group for the fossil fuel industry. May, who also worked as Donald Trump’s campaign director for North Carolina, cited the utilities’ “comprehensive studies” as reassurance. “It is imperative to trust the process,” he said. But the studies have not been comprehensive. In fact, FERC glossed over the environmental justice portion of both the draft and final environmental impact statements. Several key studies on endangered species and habitat loss hadn’t been conducted when the draft was open for public comment. And even the final version — which is not subject to public comment — lacks a sufficient number of biological surveys. According to the FEIS, “they are pending.” Duke, Dominion and the US Army Corps of Engineers are still determining how to mitigate damage to wetlands, which are vital for wildlife, flood control and pollution prevention. According to federal documents, only 20 permanent jobs would be created by the pipeline. Supporters like Betts, say that industry, powered by additional natural gas supplies, would locate to eastern North Carolina. But that is mere speculation. Deadline: Saturday, Aug. 19, 5 p.m.
Email: PublicComments@ncdenr.gov. Include “ACP” in the subject line. Public comment is not accepted on FERC’s Final Environmental Impact Statement. A federal decision is due Oct. 19.